Low Power mode may not be one of the flashiest features coming with iOS 9, but it’s still a big deal. Now a new report reveals exactly how it works and what you’ll sacrifice for better battery life. First of all, you’ll see your phone’s general performance drop significantly. 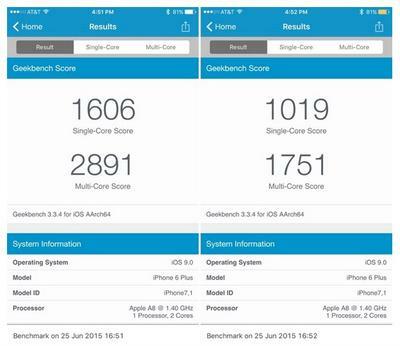 MacRumors ran some benchmarks on a an iPhone 6 Plus and saw its single-core score drop from 1606 to 1019 once Low Power mode switched on. The iPhone 5s also dropped by about 40 percent in a similar benchmark comparison test. Beyond processing power, the new feature will also disable certain battery draining functions. That includes automatic email checks, background app refresh, motion effects and any animated wallpapers. You can turn on Low Power mode by jumping into a new “Battery” section of the Settings menu in iOS 9. Apple will also prompt you to switch the feature on with a quick popup window once you hit 20 or 10 percent battery life. When active, the battery icon on your display will turn yellow. It sounds like a pretty effective way to help stretch out that last bit of battery life. You can always just lower the brightness and close some apps to help save battery life, but Apple’s decision to slow down the phone’s processor should make a big difference too.